Badge of Honour takes its concept from The Chapel of St Lawrence’s previous use as a Grammar School. Libertarian, activist and journalist Richard Carlile (b.1790) was an ex-pupil of the school and a campaigner for civil rights, women’s suffrage, freedom of speech and expression, and a ‘free press’. 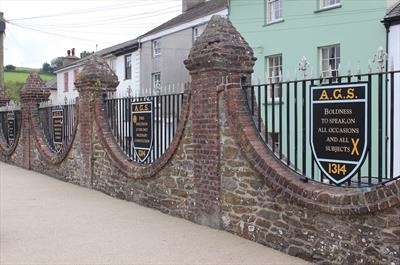 The hand painted, ‘alternative’ school crests were chained to the railings, and based on the old Ashburton School badge and Carlile’s social statements. The work formed part of the inaugural Ashburton Art Festival.